Every year hundreds of Iraqis are killed or maimed by cluster munitions and landmines, due to Iraq’s contamination of millions of explosive remnants of war. Demolishing marker. An explosive ordnance disposal operator sets out warning flags to cordon off a demolition area. Already two accidents happened in these areas. One was a child on his way to school. He died immediately. The other one was a farmer in need to clearing his land for agriculture. Saddam Hussein deployed his army in this area when he was invading Kuwait. The American army decided to bomb the area by using cluster bombs. DDG teams have already destroyed more than a thousand BLU 97. The work still going on and it will take many years to come before all the areas are declared safe. 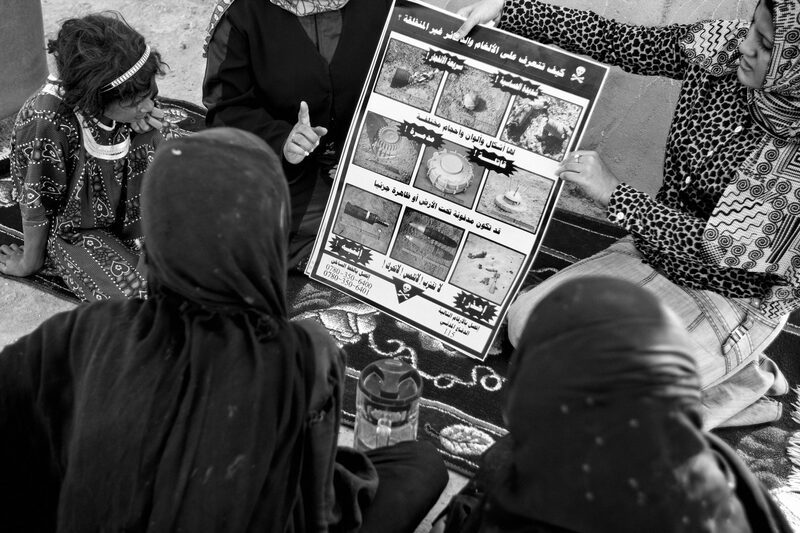 Mine risk education team shows to a family of farmer a poster listing the most common Explosive Remnant of War found in Basrah governorate area. Not long ago, Danish Demining Group found a sub munitions not far from this farm. 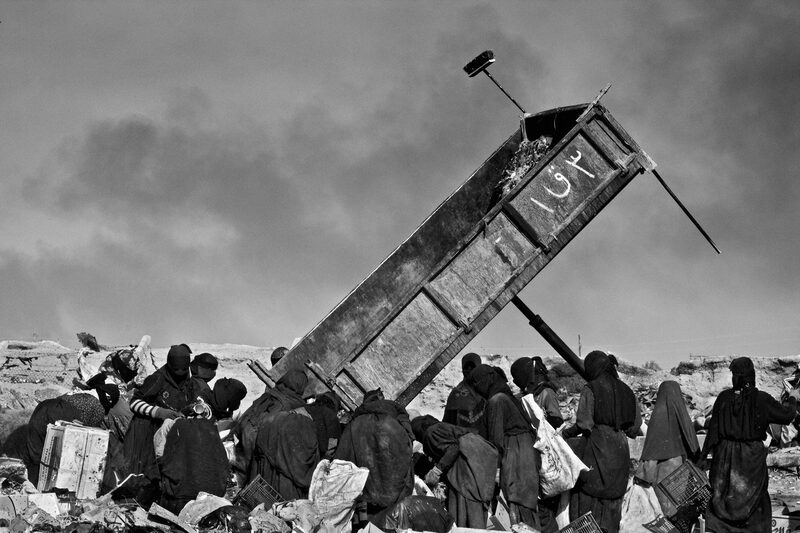 Group of women search through rubbish from a lorry that has just arrived in Al Shaaba dump place, in Basrah governorate. Farmers, quite often, clear their land from rubbish left over the twenty years of war and take it to this damp place. A year ago DDG (Danish Demining Group) was called to come here because someone has found an UXO. 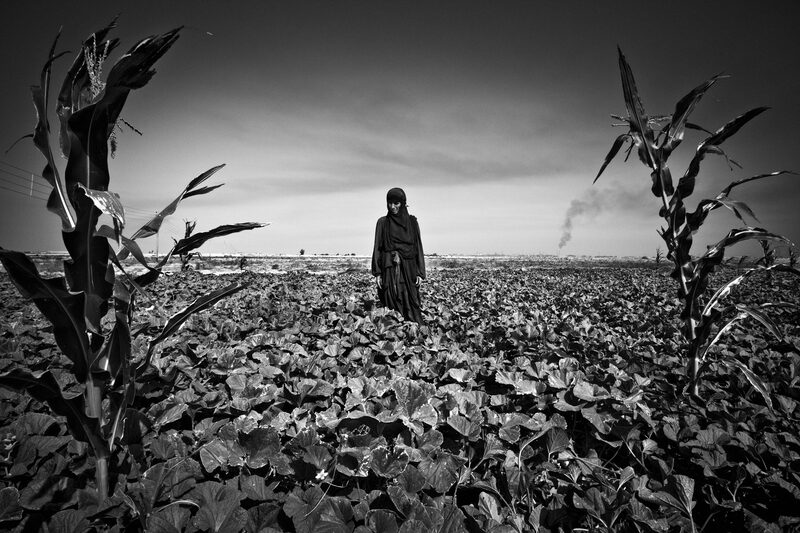 Nasma Motrar inside the gardens which just one year ago was fully contaminated by cluster bombs in Basrah governorate. She can grow tomatoes, watermelon, cucumbers and corns. Nasma doesn’t own the land. She works as a season labour. She says that the land belongs to a very rich person. Boshra Yasen, 25 years old, photographed inside the kitchen in her house in Basrah with her daughter Roqya Guda. Boshra had problem to remember the date of the accident. She thinks it was 7 or 8 years ago. Her job was to look after the sheep - she said “I was just following them”. When I asked her how she feeds her children she told me that three of her young kids make some money collecting rubbish (plastic/cans etc) around the city. None of them are going to school, as they don’t have money to buy the uniform. 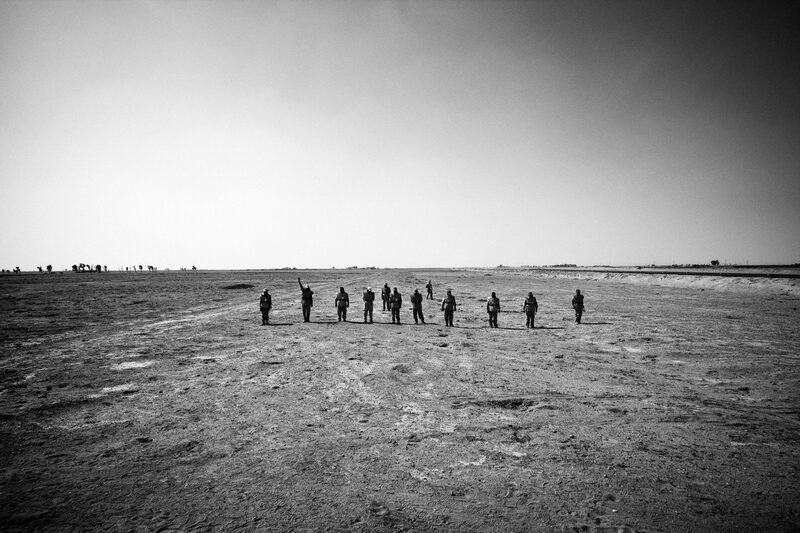 DDG (Danish Demining Team) searches the ground for Explosive Remnant of War in Basrah governorate. 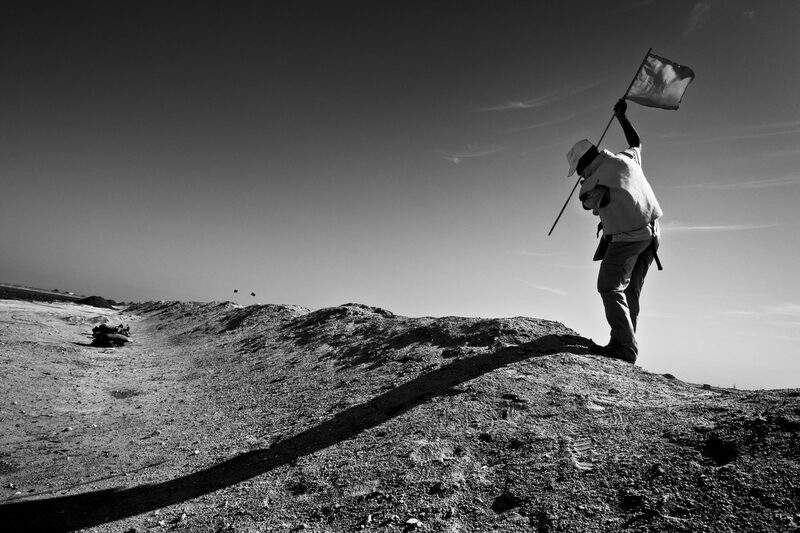 The moment a deminer sees something suspicious he rases his arm in the air and shouts stop and put a flag in the ground approximately 30 cm away from the object. 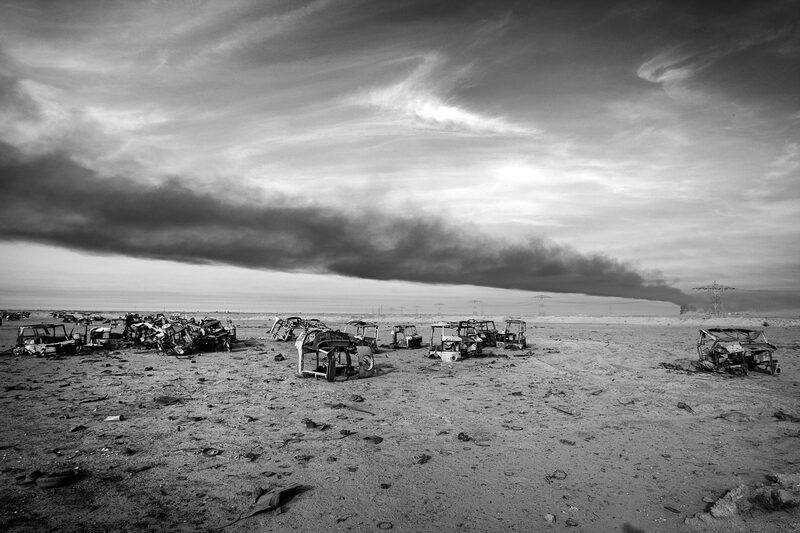 This particularly field is contaminated by Cluster bombs dropped by the American during the Iraqi invasion of Kuwait. So far DDG has found 225 BLU 63 Cluster bombs. 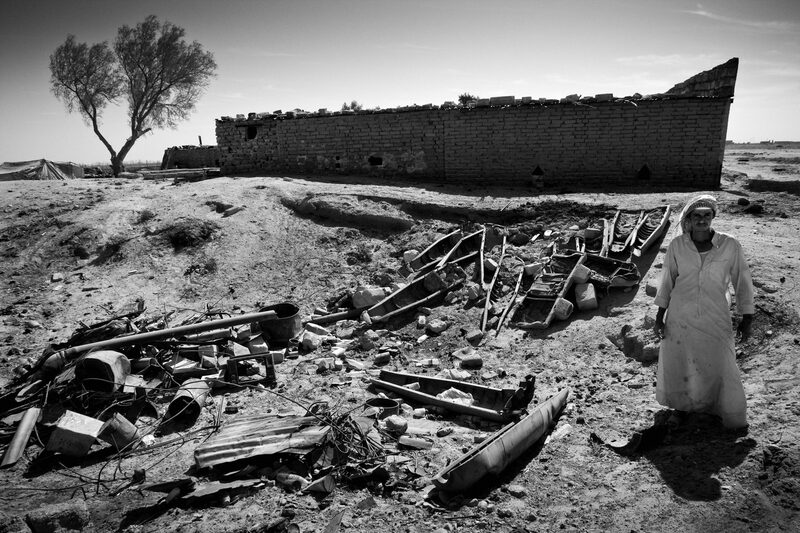 Raheem standing behind his house full of cluster bomb shells that he had collected in order to start farming again. His farm is surrounded by fields contaminated by BLU 63. Raheem told the DDG (Danish Demining Group) team that in the middle of his tomatoes field he found another cluster bomb. When he was told that they couldn’t remove it because it was unsafe, he almost refused to let them blow it up because the explosion would have destroyed some tomatoes plants. A suspected contaminated farmland with ERW (Explosive Remnant of War) littered with burned out tracks. A reminder of a too long and bloodywar.